Gold Testing Machines For Hallmarking Centres - Fischer Measurement Technologies India Pvt. Ltd.
Gold testing machine in hallmarking centres: XDAL237 is engineered under the firm direction of experienced quality controllers. 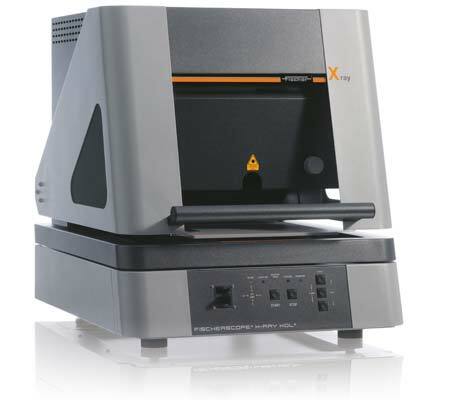 These are widely used as X-ray fluorescence measuring instrument with a programmable XY-stage and Z-axis for automated measurements of thin coatings in Gold Hallmarking, Assaying and Manufacturing Centres.These are widely used for non-destructive measurements and analysing very thin coatings. These are uniquely designed and developed with high-precision, programmable XY-stage and an electrically. These are user-friendly bench-top instruments acclaimed for sample stage moves into the loading position automatically, when the protective hood is opened. These are compact sized, robust designed and ensure longer stability. Its laser pointer works as a positioning aid and supports the quick alignment of the sample to be measured. These are operated through the powerful and user-friendly WinFTM® software and designed as per German regulations „Deutsche Röntgenverordnung-röv“. Its entire operation and evaluation of measurements as well as the clear presentation of measurement data is performed on a PC through software.